The StripHair Gentle Grooming Kit is all you need to keep your horse looking great throughout the year! This tool is highly effective on loose hair, especially during shedding and is also great for keeping the coat clean. The large StripHair is an all-purpose grooming tool that will effectively and gently remove loose hair, dirt, dust, dried mud and sweat. StripHair can also be used to massage tired muscles and bathe your horse. The mini StripHair tool works the same, yet is flexible and gentle on areas like the face and legs. It can also be used on pets, clothing and numnahs to help remove hair. 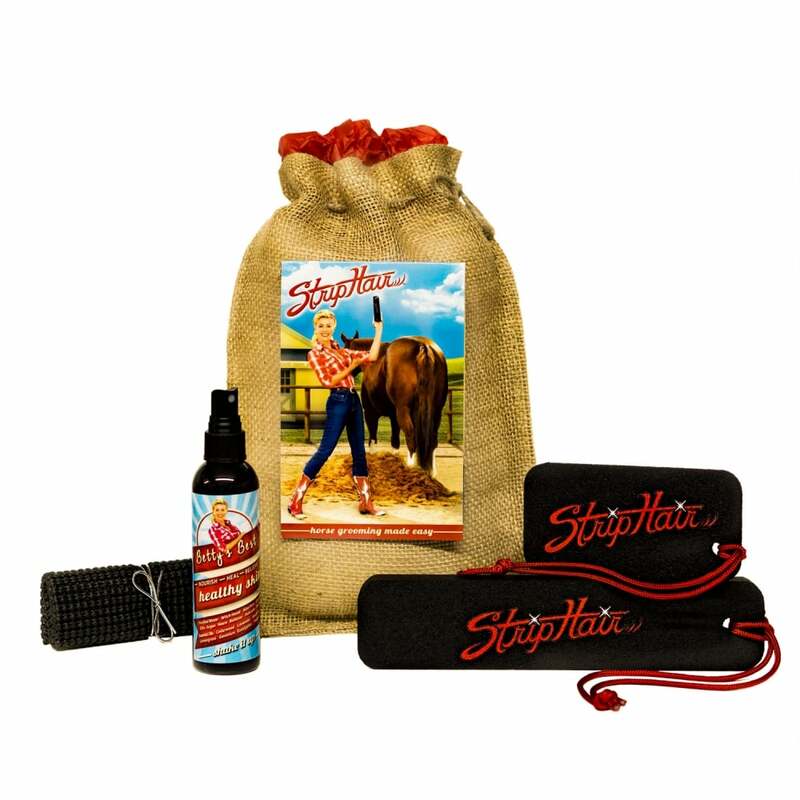 The StripHair Gentle Grooming Kit for Horses includes a large and mini StripHair Groomer, Betty's Best Healthy Skin Spray (an all-natural healing spray for a variety of skin issues), a StripHair Grooming Cloth (use to clean the horse's face, wipe away dust on the coat, or to clean your StripHair tools) and a burlap bag to use for storing everything. This is a summary of our returns policy, for full details visit our Delivery Details page. You have 28 days to return a non-sale item to us; items must be in their original packaging (all tags attached), unworn and not damaged. A full refund or exchange will be given. You have 14 days to return a sale item to us for a full refund; you then have a further 7 days in which you can return the item but no refund can be given - you will be offered either an exchange or credit note (valid for 12 months). If an item is faulty on arrival you have 14 days in which to contact us for a full refund or exchange. If an item is faulty you will be sent a postage label to return the item to us at no expense to yourself. Please contact us to advise of the fault and request a postage label. We regret we cannot reimburse your postage costs if you choose not to use a pre-paid label. Items deemed faulty after this period will be dealt with on a case by case basis in consultation with manufacturers. If a parcel looks damaged on arrival do not sign for it; instead refuse the parcel as damaged during posting. We offer an extended period of returns at Christmas for goods purchased as Christmas presents. All orders will contain a returns form, please follow the instructions on this form to return an item. You must make your own arrangements to return goods to us and all postage costs are to be covered by you unless the goods are deemed faulty. We recommend that you obtain proof of postage as Horse Direct cannot be held responsible for any items lost during transit back to us. To see our full Returns Policy please visit the Returns Information page.